Provides description & analysis of these two technologies on the enterprise network architecture and the resulting changes to the structured cabling system needed to support the new system architecture. Provides status and future directions for wireless local area networks (WLANs) and WIFI. Describes current cloud computing service offerings and rationale for using cloud computing. Copper cable by UTP, STP (shielded) and coax, by plenum & non-plenum, UTP & STP by category, coax by type. Copper Apparatus: patch panels, outlets, connectors by category. Fiber cable by data center versus other uses, by MM&SM, by LOM (laser optimized multimode), data center by harnesses, trunk cables, equipment cords. Fiber Apparatus by data center – other uses, data center by cassettes, modules, work area modules, other by fiber interconnects, outlets & connectors. Five year forecast, year-by-year, from 2011 through 2017. Includes both value and volume forecasts. 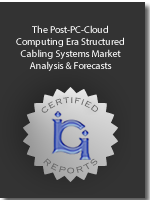 Most data includes pre-Post-PC-Cloud Computing and actual with the new technologies.